A Follow Spot: The Zombies Are Coming! The Zombies Are Coming! The Zombies Are Coming! The Zombies Are Coming! I had a chance to ask Jesse Petersen, the author of MARRIED WITH ZOMBIES, the first book in a terrific new series from Orbit, a few questions about the book and her writing life in general. I think you'll enjoy hearing what Jesse (pictured at right) had to say. Julie Kistler: First off, let's talk a little about your career. I seem to remember that your college degree is in psychology. How did you go from that to a career in writing? Was writing something you always wanted to do? Jesse Petesen: I always dreamed of being a writer. I actually won a Young Authors award when I was a kid. But I figured it wasn't something I could really do. I needed a back up. I really enjoyed studying psychology and had every intention of becoming a marriage counselor but the more I did field work, the less happy I was. Writing really kept calling to me and finally my husband said I should just do that. So I was very lucky to have a supportive partner who believed in my dream even when I sometimes didn't. JK: You've had a how-to website for prospective writers called Passionate Pen for some time. How did that get started? Do you think that helped you along your own journey to selling the first book? JP: Yes, I've done The Passionate Pen for eleven years now. I really just put together a site full of resources I wanted as an aspiring author and figured might be useful to other people. Over the years, it grew to include even more resources, including my diary toward and beyond publication. I think it definitely made me more aware of the publishing industry, which helped while I was unpublished. Plus, once I sold my first book I definitely had potential readers who already knew who I was. JK: When did you sell your first book? Tell us about that. JP: In 2004 I had a new agent and a historical romance that I wanted to sell (it was my tenth historical manuscript). She pitched the book around and called me one day in September to tell me Avon had made an offer on two historical romances. My first, SCANDALOUS, came out in 2005 and my 14th and 15th books with them will come out this year and next. So it's been a very nice ride. JK: Given all the historical romances, MARRIED WITH ZOMBIES is quite a departure for you. Can you tell us where you got the idea and what prompted this zombie invasion? JP: I always say I didn't mean to write a zombie book! It just happened. My husband and I had gone to "Zombieland" with some friends. I really loved the movie and the next night I found a scene coming to me. The opening scene of MARRIED WITH ZOMBIES where David and Sarah realize their marriage counselor is now a zombie and they have to kill her. Once I started writing, the book just flowed from me. I was so excited to write it and now I'm equally excited for everyone to read it. JK: You start off the book with a very unhelpful marital counselor. Is that a callback to your past studying psychology? JP: Everyone keeps asking me that. I probably wouldn't want to know what a real psychologist would say about me killing the thing I once thought I'd be. I'm sure it means something. But honestly, I just had such a strong image of David and Sarah's story starting with their marriage counselor that I just had to do it. JK: The fact that Sarah and David have not been getting along as a married couple really gives the book a different twist from other zombie books, and you've incorporated that into little helpful hints at the beginning of each chapter, like my favorite: "Balance the workload in the relationship. No one person should be responsible for killing all the zombies." Where did the idea of combining marital discord and zombies come from? JP: Really just from that first image in my head. And the idea that Sarah and Dave would use their dead counselor's advice to escape the apocalypse. That made each chapter header very easy to write and the story flow pretty naturally from that concept. JK: I know you grew up in Idaho, but lived in Seattle, just like Sarah and David in the book. And now you're in Illinois. Where do you feel is really home at this point? Why did you decide to set MWZ in Seattle? What makes it more zombie-riffiic? JP: Well, we've lived in Illinois for almost 9 years so it's home, at least for now. I'm not really like Sarah in that wherever my husband is, that's where I'm home (though Sarah certainly learns some lessons by the end of the book). As for why Seattle, I wanted to set the story in a large, urban environment and I'm still most familiar with Seattle. Plus, it's Seattle. By definition it's cool! And beautiful (except for those pesky zombies). JK: I'm used to your angsty historical romances, and this is ultra-contemporary, irreverent and hilarious. If I didn't know you better, I would say MWZ was totally your real voice as a writer. It sounds SO you. Or maybe you're just multi-voiced? What do you think? JP: I think they're both my real voice. I've tried writing lighter historicals and it just never worked. My natural voice in historicals is dark and sensual. But with the zombies, they just came out so funny and so irreverent. So I guess multi-voiced is the way I am. JK: What can we expect from books 2 and 3 in this series? Same characters? The continuation of Zombiebusters Extermination, Inc? And when will are those books scheduled to be out? JP: Yup! Same characters throughout the series. In the second book Dave and Sarah have created Zombiebusters Exterminators, Inc and are working full-time as zombie exterminators. But then there's a mad scientist and a potential cure and all kinds of hijinks. And I'm writing the third now, but let's just think zombie benefits without the zombie side-effects and stalkerazzi reporters and washed up rock and roll stars. I'm having such fun working on it. FLIP THIS ZOMBIE is the second and is scheduled for January 2011. THE ZOMBIE WHISPERER is due out in June 2011. JK: Anything else you'd like to tell readers about MARRIED WITH ZOMBIES or the Jesse Petersen Writing Experience? 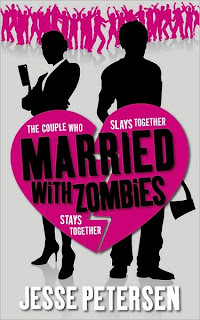 JP: Well, if they like irreverent, sarcastic, slightly gory comedy involving death, divorce and raving zombies, I hope they'll pick up a copy of MARRIED WITH ZOMBIES and enjoy reading it as much as I enjoyed writing it. You can pre-order MARRIED WITH ZOMBIES at Amazon or Barnes & Noble right now or look for it in your friendly neighborhood bookstore in September. THanks for the interview, Julie! :) Hope people like MWZ!! Great interview!!! Looking forward to the rest of the series! L'entretien est très magnifique! I'm in the dark when it comes to romances (bad pun not intended), but I don't think I can resist MWZ. It was wonderful to read about the inspiration behind MWZ, and what does and does not work when Petersen sets out to write a book. And hey--I'm a Young Author, too! My story was about a crime-fighting calico cat. I'd love to know the subject of Petersen's . . . A zombie-fighting calico cat? I know she's off visiting a new nephew (and his brother) at the moment, but maybe she will tell us the subject of her winning story when she gets back. Meanwhile, I would love to read about the crime-fighting calico cat. That's right up my alley. Pun intended. Watch Out for the Zombie Invasion -- August 31!